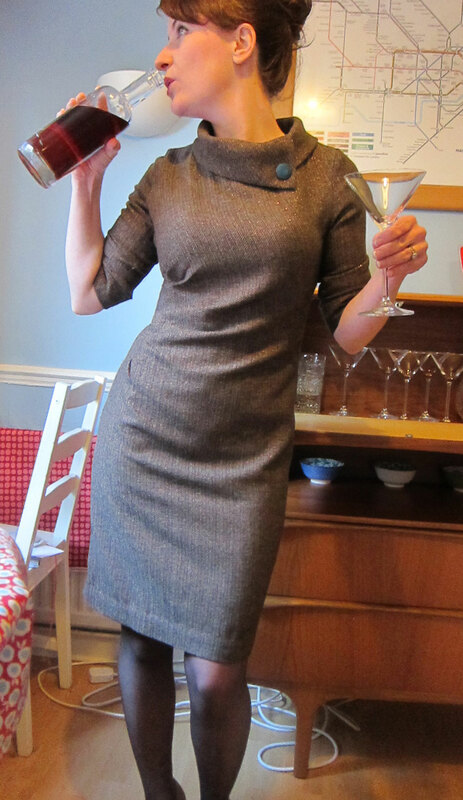 This entry was posted in Dressmaking, Sewing projects, Stuff I've made and tagged Dresses, Joan Holloway, Mad Men, New Look, Walthamstow Market by Joanne. Bookmark the permalink. Thanks Stevie! Get it – you won’t regret it I promise 🙂 I thought I’d have a bit of fun with the pics this time round so thank you very much! I might be able to squeeze a slip in there. Definitely going to make it again though – it is an amazingly flattering dress that seems to suit everyone! This dress is perfection Joanne, the style seriously suits you! I know you had issues with the fabric, but the colour is really great too. I’m with Jane, if you haven’t lined it, maybe you could try a half slip with it. I’m in the process of making a slip using Tasia’s easy peasy tutorial here http://sewaholic.net/make-your-own-slip-version-1/. I too have been scared in the past to line certain garments, so I’m hoping a slip will allow me to still wear them comfortably! Ooh I like this tute Marie. I have a slip but it’s a bit too long for most of my dresses – i always see it hanging behind the vent and that kills me! Good call 🙂 Looking forward to seeing your slip finished! whoohooo (wistle) that is one amazing dress! I love it!! And the photos are great 🙂 You do Joannie proud! Thanks Debi! Happy birthday for yesterday too – I tried to leave a message but Google Chrome won’t let me select a profile so I can then submit it. Ack! Happy birthday anyhoo! The dress fits you beautifully! Glad you prevailed! It looks fantastic, the fit is beautiful. Brilliant job. Ooh, this is fabulous! Seriously, so flattering and chic! Every time I see one of these I so desperately want to make one! That is a truly lovely dress. The fit is gorgeous. I applause your Joannie photo! I must tell you, don’t let lining a dress scare you! It intimidated me at first, too, but once I tried it, I couldn’t imagine what I was so worried about. I would suggest trying it with a sleeveless dress, first. Really, all you’re doing is sewing a second dress and attaching it to the first. It really is easy-peasy. Awh thanks Amanda! I need to get over the fear factor don’t I?! Gorgeous! What great fit! And the fabric really works. I love the covered buttons, too. Wowsas, thats a lovely dress. I love the gathering at the side. Very flattering. Love this dress! Especially the collar. It fits you wonderfully and the pictures are great! How difficult was working with this fabric (except for the raveling)? I’m considering ordering something similar. Hi Heather – thanks mate! Other than the fraying nature it was really good. Although be warned – it’s itchy! Great dress , awesome photos ! Love this dress! You look awesome! gorgeous dress, love the teal button!. I hope it ends up lasting for a bit. It’s too cute to fall to pieces. This dress is amazing! The fitting, the fabric, it’s all too awesome. That booty shot nearly made me fall off my chair though! I, too, have done the booty check. Love it. Beautiful, stunning, gorgeous and lovely!!! Well done! Hey, I love your dress – I hope the fabric holds out for you to keep wearing it. I have *just* seen that you are Coletterie’s featured seamstress for your peony dress – congrats! Oh Godddddd I love this! It’s a great shape in such a classic color/fabric. You look fantastic! Argh now I want to make up this pattern… must not buy anymore patterns… why do you tempt me?! Buy it Lauren buy it. Buy it now! You’d look so cute in it! SMASHING! This dress definitely conjures Joanie! Gorgeous work! Oooh just gorgeous! Looks like a great fit and super stylish. I made the version with the side pleats too, and love it as a simple but unusual feature. I am so sorry for the incomplete comment above. I’m doing this by iPhone and it’s over eager! So, I was expressing my awe at such a wonderful rendition of new look 6000. It’s awesome Joanne! 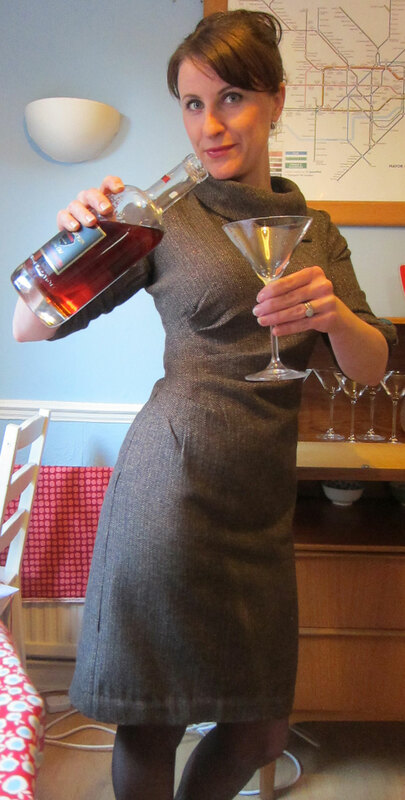 And your photos are also particularly entertaining and brave ( joanie pose !) it’s a very trim dress, über flattering, and looks like you’ve done a fab job. Hurrah!! Heheh I thought as much Winnie 🙂 Cheers! Oh, I love a dress with sleeves. I agree… very grown-up. Well done! Ha, it looks wonderful! Love the pictures, too! I had this pattern in the mail today – finally! I really had to have it after seeing Scruffybadger’s PanAm version! Now, what fabric to use…? Eek I love the different looks that one pattern has brought out, it has been on my wishlist a while now. Loving your Joanie pictures! This post was featured on New Look’s Facebook page. I will include the link to the page so you can have a look. Please invite your followers to see your post on our page. I hope you continue doing wonderful work and include New Look into your designs. Have just found this pattern on line and decided to make it for a friends wedding, but I am doing the version with the waist flower on. I have a super M&S Per Una wool purple coat that I want to wear to the wedding and I think this style dress will go superbly with the coat, only thing is I can’t find/decide what material to make it in!!! Does the dress make up big or do I need to go up a size so I can “fit” it to my shape??? I have never fitted a pattern, I am usually a cut and go sort of gal when it comes to my dressmaking attempts. Hi Noeleen! Ooh now it’s been a long time since I made it up but I would make sure to check the ‘finished garment’ measurements rather than the standard pattern measurements – this will give you more of an idea of fit once it’s finished. 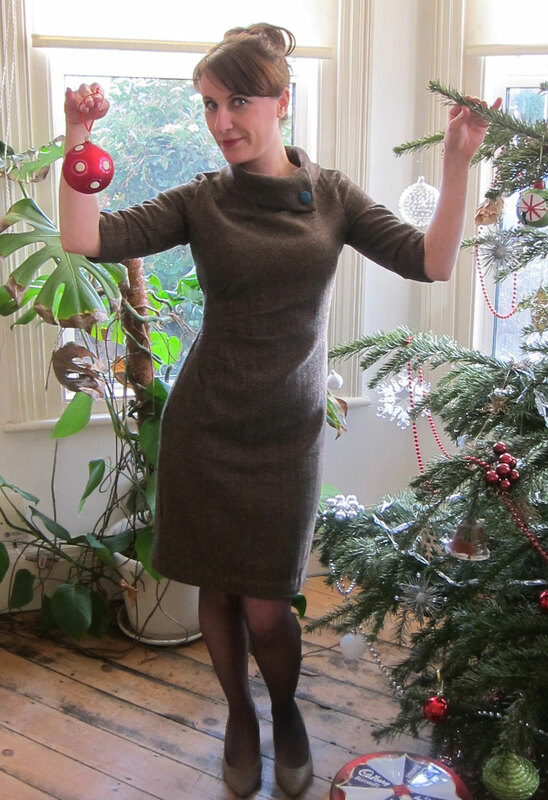 Tilly has a great tute on this http://www.tillyandthebuttons.com/2011/01/cutting-out-right-size-pattern.html. I wouldn’t just go up a size and then fit down as you might waste fabric and give yourself more work than you have to. Ideally pick a size and then make up a simple bodice muslin (without sleeves or skirt) to check the waist and shoulder fitting as they are what you want to gtet really right. In terms of fabric, if it’s a winter wedding then a wool would be fabulous but you can see lots of different types of fabric used for the same dress here at Scruffy’s frock fest http://scruffybadgertime.co.uk/2011/12/new-look-6000-frock-fest-2/, from knit to wool and silk! Good luck! I read on another blog that someon used this pattern, version e (I guess without sleeves) to make a lining for version c). HTH for your next dress! Could someone help me with this pattern please?!! I’ve reached the stage where I am trying to attach the collar (first time I’ve done a collar) and if I am reading the pattern right then my collar is pinned on to the outside of the dress. However I don’t see how this results in the collar shown in the picture on the pattern?? Surely the collar should be pinned on the inside of the dress (wrong side) and then folded over to hide the seam? I assume the neck facing forms a layer between the outer neck and the collar or should the facing be on the inside of the neckline (I.e touching skin)? ?